The division deployed into Auckland, New Zealand, between January and March 1943. In June of that year, it moved onto Guadalcanal for additional training. 1 November 1943 saw the division land as part of the Battle of Bougainville and fight on the island until their last unit to arrive, the 21st Marine Regiment, embarked on 9 January 1944. During the course of the battle the division had about 400 Marines killed. The division returned to Guadalcanal in January 1944 to rest, refit, and retrain. The next operation in which the division took part was the Battle of Guam. From 21 July 1944 until the last day of organized fighting on 10 August, the division fought through the jungles on the island of Guam. During these 21 days of fighting, the division captured over 60 square miles (160 km2) of territory and killed over 5,000 enemy soldiers. 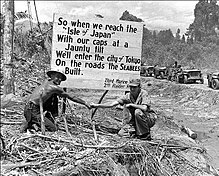 The next two months saw continuous mopping up operations in which the Marines continued to engage leftover Japanese forces. At the end of the battle the division had sustained 677 Marines killed, 3,626 wounded, and nine missing. The division remained on the island of Guam for training, until it embarked as part of the landing force for the Battle of Iwo Jima. The 3rd Marine Division was initially in reserve for the battle. However, the division was committed one regiment at a time when the initial regiments that landed there needed to be relieved. The 21st Marines came ashore on 20 February followed by the 9th Marines, and then were reinforced by a battalion from the 3rd Marines on 25 February. The Marines of these two infantry regiments, supported by the artillery of the 12th Marine Regiment and tanks of the 3rd Tank Battalion, fought on Iwo Jima until the end of organized resistance on 16 March and the subsequent mopping up operations for the next month. All elements of the division were back on Guam by 17 April 1945. The fighting on Iwo Jima cost the 3rd Marine Division 1,131 killed in action and another 4,438 wounded. After the return to Guam, the division began preparing for the invasion of Japan. This invasion never took place since Japan surrendered on 14 August 1945. The 3rd Marine Division was deactivated on 28 December 1945. During the war, the 3rd Marine Division had three Seabee Battalions assigned to it. The 25th Naval Construction Battalion (NCB) was posted to 19th Marines as the third battalion of the regiment. These landed on Bougainville, as did the 71st NCB which was assigned as the 3rd Division's shore party there. The 25th NCB also landed during the assault on Guam as the shore party to the 3rd Marine Regiment, after which the 19th Marines were deactivated, and the 25th NCB was reassigned. The 62nd NCB was then posted TAD to the 3rd for Iwo Jima. They were in the reserve, but they became the lead battalion in getting airfield No. 1 operational, after of the many casualties taken by the primary assault Seabees, the 133rd NCB. The division was reactivated on 7 January 1952 at Camp Pendleton, California, using the assets of the 3d Marine Brigade activated in June 1951. Immediately after its activation and still in its organizational state, the division began intensive combat training, including new tactics and maneuvers based on lessons learned in the then-ongoing Korean War. During the remaining part of 1952 elements of the division participated in numerous exercises and training problems, including vertical envelopment (helicopter landing), airborne operations and attack, and defense against atomic weapons and missiles. The 1st Battalion, 3rd Marines, 3rd Marine Division, were the first Marines to be sent to Vietnam in March 1965 to protect the Da Nang Air Base.On 6 May 1965, the 3rd Marine Division opened the Marine Compound at the Da Nang Air Base, Vietnam. By the end of 1965 the division had all its regiments (3rd Marines, 4th Marines and 9th Marines) on the ground. In August 1966, the battalions of the 26th Marines (a 5th Marine Division unit) began arriving for combat duty in South Vietnam attached to the 3rd Marine Division. In October 1966, then commanding general Lewis W. Walt was ordered to establish strong points just south of the Vietnamese Demilitarized Zone (DMZ). The 3rd Division moved its headquarters from Da Nang to Phu Bai in late 1966. At the same time the division was also building outposts along the southern half of the DMZ at Con Thien, Gio Linh, Cam Lộ and Đông Hà. The first major multi-regiment operations against the People's Army of Vietnam (PAVN) was Operation Hastings in July 1966. Operation Prairie followed in October. This area would come to be known as Leatherneck Square. In late 1967 the headquarters moved again from Phu Bai to Đông Hà in the Quang Tri Province and more outposts were opened. Camp Carroll, Rockpile, Ca Lu and Khe Sanh. The two main enemy divisions the Marines fought were the 320th Division and the 324B Division. On November 14, 1967, the 3rd Marine Division commander Major General Bruno Hochmuth was killed northwest of Huế in a helicopter crash. Some of the major operations in 1967 and early 1968 in this area were Operation Prairie III, Operation Prairie IV, Operation Hickory I, Operation Cimarron, Operation Buffalo, Operation Kingfisher and Operation Kentucky. Nearly 8,000 PAVN were killed during this time period. The Marines suffered over 1400 killed and over 9,000 wounded. There were five Medals of Honor awarded and nearly 40 Navy Crosses given during this period of time. For extraordinary heroism in the Republic of Vietnam from 8 March 1965 to 15 September 1967, the division was awarded the Navy Presidential Unit Citation. During the 1968 Tet Offensive, the division conducted operations along the DMZ with a portion of the division fighting in the Battle of Huế. The operational tempo increased with the initiation of the Tet Offensive in late January 1968. At the time, 3rd Marine Division intelligence estimated the combat strength of PAVN and Viet Cong (VC) forces in the DMZ area was 40,943 troops. The PAVN and VC stepped up their attacks by fire on every combat base in the division area of operations. This included daily attempts at interdiction of naval traffic on the Cua Viet River near Đông Hà. The division had to invest many of its assets to open the Cua Viet River to traffic. BLT 5/l, the Landing Force of SLF B, remained under the operational control (OPCON) of the division throughout February 1968. BLT 3/l continued Operation Saline under operational control of the 1st Amphibian Tractor Battalion with the mission of clearing the area adjacent to the Cua Viet River between Cua Viet and Đông Hà. BLT 2nd Battalion, 4th Marines, the Landing Force of SLF A, remained under operational control of the division throughout the month. BLT 2/4 conducted operations in the Lancaster II and Kentucky areas. During the Vietnam War, the 3rd Marine Division suffered 6,869 men killed in action. The division departed South Vietnam in November 1969 with more than 20 Marines having received the Medal of Honor and moved to Camp Courtney, Okinawa, where it is presently located. ^ "Facts about the Vietnam Veterans memorial collection". NPS.gov. 2010. Archived from the original on 28 May 2010. Retrieved April 26, 2010. ^ "Lyndon B. Johnson: Presidential Unit Citation Awarded to Third Marine Division, Reinforced, Fleet Marine Force Pacific". www.presidency.ucsb.edu. Retrieved 5 April 2018. ^ Pike, COL Thomas F., Military Records, February 1968, 3rd Marine Division: The Tet Offensive, p. 115, ISBN 978-1-481219-46-4. NVA and VC Order of Battle information is located on pages 114-127. ^ CDR Kenneth Davis, USN (ret), and associates of the Coffelt Database of Vietnam casualties. ^ "Lineage and Honors". caltrap.org. Retrieved 28 November 2018. Coan, James P. (2004-08-10). Con Thien - Hill of Angels. Tuscaloosa, Alabama: The University of Alabama Press. ISBN 978-0-8173-1414-9. Pike, COL Thomas F. Military Records, February 1968, 3rd Marine Division: The Tet Offensive. Charleston: Creatspace. ISBN 978-1-481219-46-4. Rottman, Gordon L. (2002). U.S. Marine Corps World War II Order of Battle – Ground and Air Units in the Pacific War. Westport, Connecticut: Greenwood Press. ISBN 978-0-313-31906-8. O'Brien, Cyril J. (1994). "Ashore in the North" (brochure). LIBERATION: Marines in the Recapture of Guam. Marine Corps Historical Center. Retrieved 2007-01-01. Jewett, Rus. "Gruntfixer: An accounting of my experiences as a Hospital Corpsman attached to "Ripley's Raiders" Lima Company 3rd Battalion 3rd Marines – 1967".